The Most Reverend Frank J. Caggiano was installed as Fifth Bishop of Bridgeport on September 19, 2013 at St. Theresa Church in Trumbull. In his installation homily, he spoke of the needs to build bridges to youth, to all those who are troubled, who are neglected and to Catholics who no longer participate in the life of the Church. 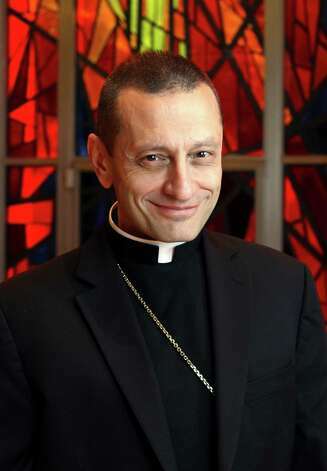 In an historic move of reconciliation, Bishop Caggiano met with the membership of Voice of the Faithful in March 2014 to discuss issues that have divided the local Church for decades. He also reconstituted the Review Board of the Diocese to oversee implementation of diocesan Safe Environments policy, and announced the formation of a new Ministerial Advisory Board to review cases in which the Bishop must consider action regarding the assignment of a priest or deacon accused of adult misconduct. In the November 2014, the bishop initiated a major reorganization of diocesan offices into a Secretariat structure in order to improve planning and the level of service and communication with parishes. He was born in the Gravesend section of Brooklyn on Easter Sunday March 29, 1959, the second of two children of Arnaldo and Gennarina Caggiano, both of whom came to this country in 1958 from the town of Caggiano in the province of Salerno, Italy. He grew up in Saints Simon and Jude Church and attended the parish’s grammar school. The Bishop’s education continued at Regis High School in Manhattan, conducted by the Jesuits, where he was a member of the class of 1977.